As soon as you start taking photographs, the world around you becomes a gallery of unique images. With the E-450, you can put your own personal stamp on those images, expressing your vision of the world with the help of an exciting selection of art filters that you can apply when you take the picture. And since the E-450 is the world's smallest digital SLR, it offers unheard-of portability, allowing you to take full advantage of its creative power anywhere, anytime. 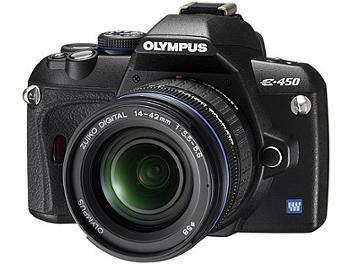 The Olympus E-450. Ready to go wherever your imagination leads you.